M:ST * Mountain Standard Time Performative Art Biennial * M:ST ** Art that makes we want to be a better artist, or, we should all be this good, all the time. Art that makes we want to be a better artist, or, we should all be this good, all the time. Merce Cunningham passed away earlier this month, and I found myself feeling very sad. I had never met him, I’m not a dancer, nor do I follow contemporary dance – the sadness, I think came from the simple fact that a photo of his piece, Antic Meet was the most recent piece to completely and totally blow my mind. I was in the Warhol Museum in Pittsburgh in June and was wandering through the display cases holding letters, album covers, catalogues and other ephemera, and suddenly, there it was. Antic Meet / Ett Nummer was first performed in 1958 at the American Dance Festival, Connecticut College. 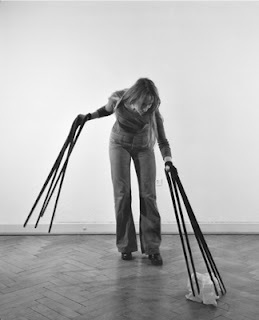 In the piece, which was accompanied by John Cage’s Concert for piano and orchestra, Sometimes: Solo for Piano, and Fontana Mix, Cunningham and others wore chairs strapped to their backs. The photos documented a series of gestures with the chairs, of Cunningham bending over, sitting and leaping. The costumes, which were designed by Robert Rauschenberg, perfectly illustrated the relationship between the body of the performer and the utility of the object. During my residency at CAMPER I have been working on what I call a mobile performance device, which is an umbrella that generates sound in response to body capacitance. It has been a difficult piece to do – a number of similar projects have happened in the past decade, so a lot of my time has been spent working on Arduino code and trying to figure out why, in spite of the similarities between these pieces and my own, and I completely and totally compelled to continue with it. Joo Youn Paek’s Polite Umbrella uses a simple drawstring to reduce the size of the umbrella’s perimeter, reflecting both the agency of the user-performer and forming a dome-shaped sculptural beacon. Mark Shepard’s CCD-Me-Not Umbrella is an umbrella housing infrared LEDs, whose light is detectable only by CCD surveillance cameras. When the umbrellas are activated, the light forms a visual barrier that interferes with the detection system. Sang-Kyun Park’s Light Drops is an umbrella that generates light in response to rain. The umbrellas are constructed from responsive fabric that generates electricity when it is hit by raindrops, which in turn power a network of LEDs lining the inside of the umbrella. The more rain that hits the umbrella, the more light that is generated. Electric Umbrella by sockmaster, distributed via instructables.com. I think the answer may lie with how one thinks about one’s work, and the lessons I’ve learned from the SOUNDBIKE. The piece was conceived in 2004, and finished in 2005, and I had many conversations with David McCallum as I was developing it. David was working on what would end up being WarBike, and had figured out a way for pD to work from a PDA. It was weird to talk with someone who was doing a piece that on one hand was very different, but was also very similar, but David was helpful and generous, and in 2007 we showed our respective pieces at InterAccess, side by side. Shortly after the piece was completed, it was included in a show in Cambridge, and then ended up at Art Basel Miami Beach. The piece was extremely popular and it ended up in design, technology and gear type blogs almost instantaneously. I found this extremely unnerving – I was often described as an inventor, a designer and a project developer, and the soundbikes, which I considered a device to facilitate a performance, were described as almost a product. So with this umbrella, on one hand, I’m treading down well-worn territory, and on the other, I’m obsessed with the performative situations that can emerge from such a device. There is tension here, between object and experience, gesture and performance, and artwork and commodity. Instead of focusing on the useful, the intuitive or the applicable, what can we learn from the awkward, the complicated and the uncomfortable? The finger-gloves are light – I can move them without any effort – feel, touch, grasp anything, but keeping a certain distance from the objects. The lever-action of the lengthened fingers intensifies the various sense data of the hand. The manual activity is experienced in a new operational mode: I feel myself grasping, I control the distance between me and the objects. 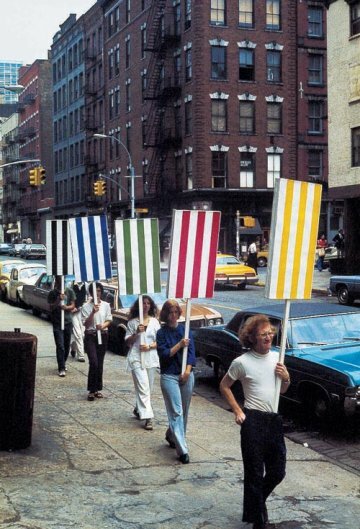 Daniel Buren’s Seven Ballets in Manhattan was a series of choreographed actions that took place in various neighbourhoods between May 27 and June 2, 1975. In the piece, five people walked through the different neighbourhoods carrying signs painted in vertical stripes in different colours. The configurations of dancers and signs were choreographed in advance by the artist. The vertical stripes, a repeated motif in Buren’s work, reflected the surrounding architecture while at the same time reducing architecture into neutral patterns. In Chalk, Jennifer Allora and Guillermo Calzadilla placed large, human-scale pieces of chalk in a public plaza outside the Parliament buildings and president’s mansion in Lima, Peru. Passersby could use the chalk to draw, write, or mark territory. As the day wore on, protesters used the chalk to express themselves politically. What is interesting to me about Allora & Calzadilla’s piece is the way in which the scale of the object informs the action taken with the object, which remains in spite of the inevitable destruction of the pieces. The large pieces of chalk, which are heavier and more fragile than the smaller pieces, became fragmented very quickly, and participants, started to use the smaller pieces to draw and write. In spite of this, the lines, text and images created still reflected the size of the chalk, and of the bodies making them. This post marks the end of my participation in M:ST 4.5 and CAMPER. Thank so much to Nicole Burisch and Keltie Duncan from M:ST, Renato Vitic, Suzanne Piechotta, and Byron Rich from TRUCK.